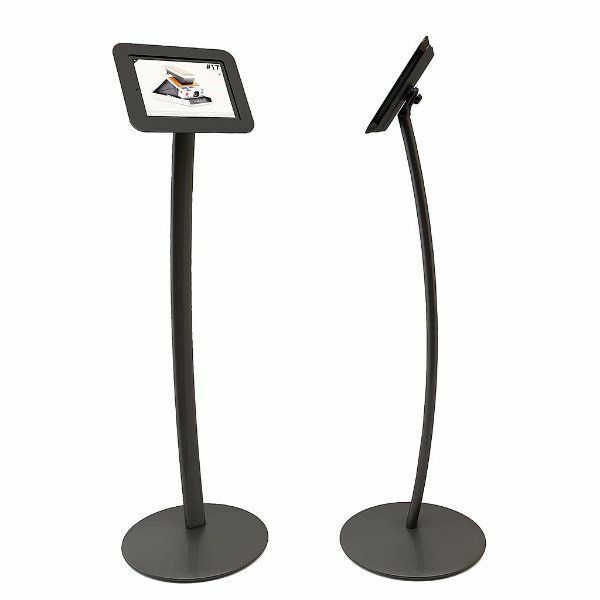 With sleek design and matt black finish, Curved IPad Kiosk captures customers’ attention in all traffic areas. 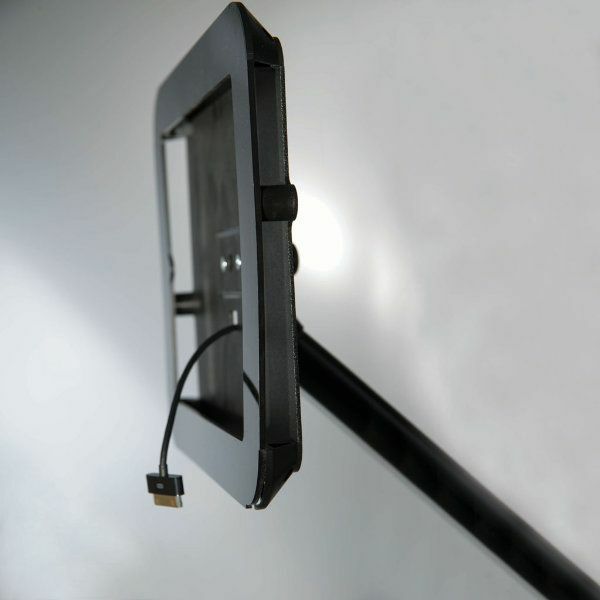 The IPad holder can be rotated to display landscape portrait positions. 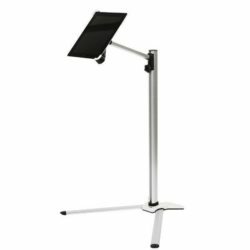 It has a complete style with black acrylic cover and cable travelling through the pole. IPad is secured with 2 tamper proof screws to reduce the risk of theft. 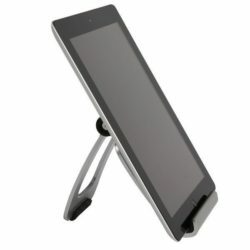 Compatible with 2nd and 3rd generation Apple® IPad tablets. Star allen key and 9.84 foot (3 m) USB cable included in the pack. don’t be behind the times! 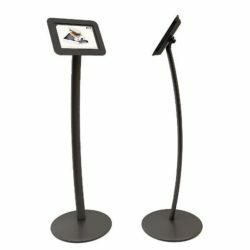 If you are frequently attending trade shows, exhibitions and conventions, make sure you have one of these floor ipad stands to digitally interact with your customers.The matt black colored, curved floor standing kiosk would fit to any environment with its basic color and stylish design to impress your prospects. 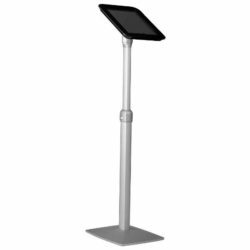 This innovative and interactive way of advertising via tablets is even more sleek and functional with the touch screen device holders. Each Ipad Cradle houses one iPad and can fit iPad 2, and iPad 3 securely. The 9.10′ cable hidden in the curved column provides continuous charging; and it comes with the product. 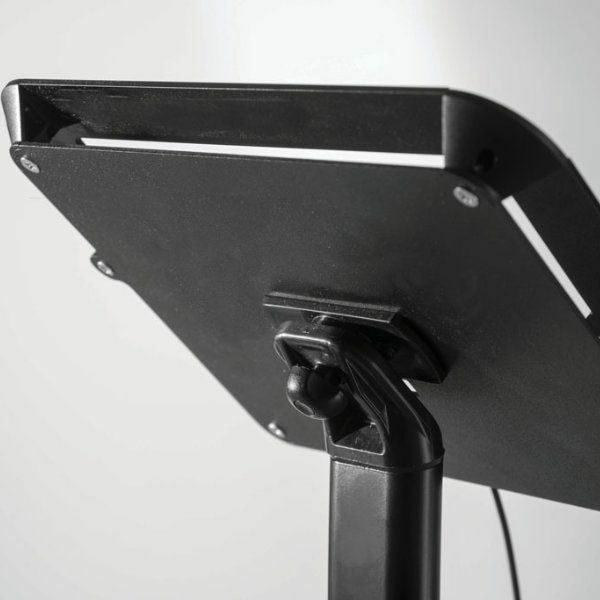 The ipad enclosure can be attached to the stand easily with the 2 tamperproof screws and the allen key provided with the products to securely hold the tablet. 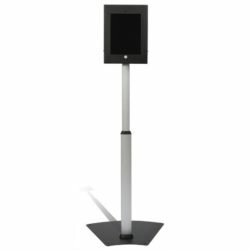 This secure housing can be positioned either portrait or landscape.This durable and theft resistant ipad holder features a steel base and an aluminum profile, hence it can be used for years. 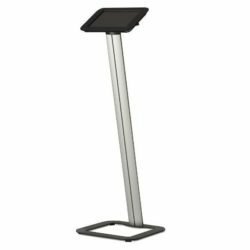 The apple tablet floor stand is the ideal way to look more up-to-date than your competitors. Select from the color and design options of Displays Market.